Anktangle: What is all this talk about princesses? What is all this talk about princesses? I feel pretty strongly that I want my child(ren) to grow up in an environment which is wholly accepting of however they choose to identify and express their gender identity, including what clothes they wear, what toys they choose to play with, and what kinds of characters they look up to in the stories we read. I'm excited to host today's guest post from Shannon of Pineapples & Artichokes, taking a deeper look into what the princess figure has become in the modern day fairy tale. Please read to the bottom to learn more about today's guest blogger. A long time ago, when I still saw every animated Disney movie that came out (I was 18, 19?) my boyfriend took me to see the Lion King at the theater our friend worked at. Another friend of his was there, someone who would probably be diagnosed on the Autism spectrum now, but back then was just one of the creepy, older, social awkward guys in our gaming group. We got to talking and I mentioned how cool it was that this was finally an original script for an animated Disney movie; although the themes have been done many times in many ways, this was their original intellectual property. "What do you mean?" he asked, "Most of their movies were written by Disney. Snow White, Cinderella, Sleeping Beauty..."
I, not very gently, explained that no, those were folk tales that have been written and rewritten for centuries. That the Little Mermaid was written by Hans Christian Anderson, and until Disney's version, it was very much his story. That Cinderella can be directly traced to a Japanese folk tale. He didn't believe me, so I started to tell him the Grimm version of Cinderella. When I got to the part about the birds pecking out the step sisters eyes, he blanched and ran off. I've been thinking a lot about Princesses lately. No one has tried to ask Moira which is her favorite princess yet, but it's started happening to her friends. I loved Disney when I was little, but while I know the marketing wasn't as intense, I think I was less likely to really get into the current princess craziness then some of my friends. Reason 1: I knew there were other versions of the stories: mostly scarier, more dramatic versions; occasionally, more fantastic, fabulous versions. 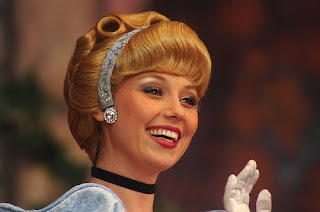 The French Cinderella gets to go to the ball three evenings in a row—with a better dress each time! We didn't have the movies available to watch all the time, but we always had the books. A few times I did a sort of "choose your own adventure," looking at my favorite sections of the same story in different books. Reason 2: My parents were in the SCA when I was a child. They were Prince and Princess of AnTir (Oregon, Washington and BC) when I was Moira's age, and Baron and Baroness of Madrone (the greater Seattle area) for years afterwards. When I was four, we made friends with a very nice couple who were becoming the next Prince and Princess (the job changes hands every 6 months) and I thought that Pam was the most glamorous person in the world, so much so that it took me years to remember her name, because she was just The Princess to me. At any rate, I knew that the job involved actual work. Diplomacy and paper work and listening to people's crazy ideas. Or you know, trying to not get killed by your parents or be forced into slavery. Somehow, neither of those options seemed that appealing. I think what bothers me more then anything about the Disney princess brand is that it wipes out their origin stories. What happened to them before they got married is the interesting part; happily ever after is always dull, but that's what they are concentrating on. When I played princess as a kid, I always focused on the before part of life, usually making up my own stories about things that happened in between or before the written versions. But much of 'imaginative' play for little girls nowadays is focused on non-active pursuits. Boys are encouraged to be race car drivers, pirates, firemen, military men. They get to save people and fight. Girls are encouraged to shop and be pretty. Both of those things are fine, but what are we teaching them when that's all we expect? What are we teaching boys when they can't do those things too? Paper Bag Princess by Robert Munsch - I've recommended this before, and I will keep doing so until everyone on the planet has a copy. Princesses Are Not Quitters by Sue Hellard - Princesses Allie, Mellie, and Libby decide to try having fun like the servants do. They quickly realize that it's a lot of hard work, but they refuse to quit. There is a sequel we haven't read called "Princesses Are Not Perfect," which we haven't read, but the premise looks promising. Princess Pigsty by Cornelia Funke - Not only does the princess get to do the interesting and messy things, but her father learns to be very encouraging of her. The Ordinary Princess by M M Kaye - Amy's parents are much less supportive of her, but she is completely capable of taking care of herself, with minor help from her fairy godmother. I loved this book so much as a preteen. My copy is completely falling apart, but I can't bear to get rid of it. I suppose I could just buy another. Any of the 'color' fairy books edited by Andrew Lang - The link is to the lilac one. These are great collections of old fairy tales. You know your kid best, so you should read them before introducing them. The tales are sometimes violent and usually scary, but even though I was an easily scared child, I loved the visceral thrill of reading these. If you read enough of them, you will see many versions of the same basic stories. Classic Treasury of Grimms Fairy Tales edited by Danielle McCole - Slightly altered to be less grim and terrifying, but still with a lot of the meanness of the world. My favorite version of Snow White as a child is in this book. A version of this post was originally published in February 2010 at my blog Pineapples & Artichokes. Since then, Moira has gone full tilt princess crazy, although she has only just realized that there are named princesses, and princess movies she can watch. Her favorite game for a few months was "Princess Firefighter." We have also been talking about the qualities that are important to be as successful princess, bravery, tenacity, honesty... I haven't yet told her that once upon a time for 6 months, my mother was a princess. I expect this revelation to blow her mind. Thanks for your perspective. I read Cinderella Ate Your Daughter by Peggy Orenstein, and that also was eye-opening for me. I read that last year too - my MIL is ever so excited that we will one day have a girl child so she can get her an American Doll and do all that jazz with her..
Oh, yea! I've had your princess article open in my browser for about a week now, Shannon, meaning to finish reading it, and then my browser crashed. How serendipitous to find it here! :) Thanks for hosting it, Amy. Very interesting perspective, and helpful for me to hear from a parent of a daughter what the landscape is like nowadays for raising girls. I used to love playing princess as a kid, but always the part leading up to discovering that one was a princess. I liked the disguised-identity aspect. I have read some of your recommendations and will check out the others. P.S. So cool your mother was a princess! I did buy her Not All Princesses Wear Pink by Jane Yolen, which is a fun picture book in which some of the princesses even wield power tools! "once upon a time for 6 months, my mother was a princess"
Yes indeed. More notably, my parents were Baron an Baroness of Madrona for 8ish years. Interesting... my Girl is a real tomboy - no interest in princesses or fairies or the ilk. We watched a film about a handsome prince saving a fair princess from an evil dragon and - no word of a lie - she was rooting for the dragon. In fact the other day when I was trying to convince her to get up an go to the loo in the night, I tried a technique a friend had told me about. In short, telling her the fairies wanted her to do it. So I told her there was a fairy in her room and that was as far as I got. She looked at me as if I'd said "There's a man in a hockey mask with a chainsaw in your room." I didn't get much sleep that night. Still, on the upside we get to dress her in colours other than pink - which is nice. I STILL love "Ordinary Princess." Another great children's book is "Not all Princesses Dress in Pink"